Modern equine dental care has advanced beyond the traditional floating of a horse’s teeth to include a thorough exam and correction of all teeth-related problems. Wild horses forage on average 16 hours per day, and subsist on a diet high in fiber, causing their teeth to wear at an appropriate rate. Domesticated horses spend far less time foraging, and as a result experience a reduction in the rate of wear, necessitating the intervention of an equine dentist. Young horses have a total of 24 deciduous or milk teeth, including 12 incisors and 12 premolars. At roughly five years of age, the horse will have developed a “full mouth”, with males having between 40 and 42 permanent teeth and mares possessing 36 to 40 permanent teeth. 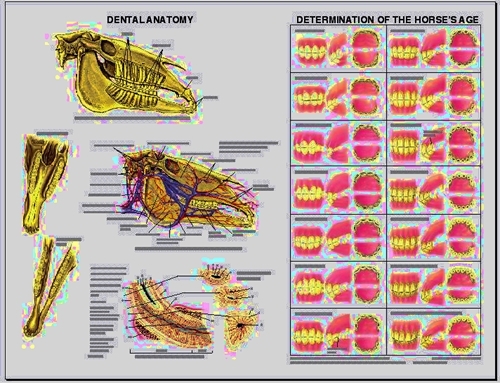 The Equine Dental Anatomy chart was provided courtesy of Lake Forest Anatomicals.